Something unforgettable is happening in Liverpool as a highlight of the city’s European Capital of Culture celebrations. Vast in scale and spectacular in execution, this breathtaking new commission from La Machine will spin a tale so magical that an entire city will fall under its spell. 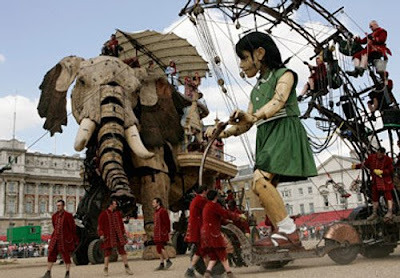 Just as The Sultan’s Elephant stopped London in its tracks in 2006, so this three-day adventure will unfold against the landmarks of a great city, stopping the traffic and captivating everyone who sees it. Prepare to be amazed by a show that will make you believe in the impossible. 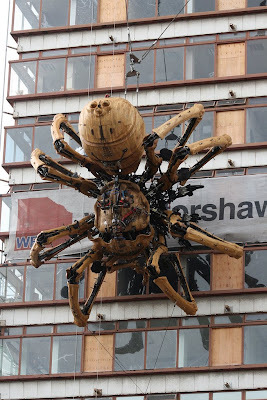 During the past 24hrs this gigantic, mechanical, 37ton, 50ft tall spider, complete with 50 hydraulic axes of movement, appeared on the side of a soon-to-be demolished building near the heart of the city, instantly creating a buzz in the area. 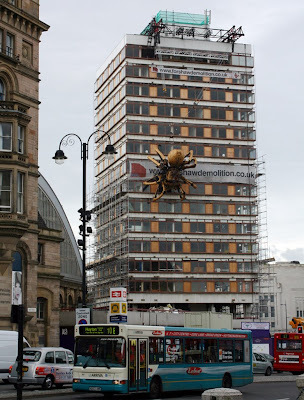 there’s been talk for the past few weeks about the show’s main star and until the spider appeared last night very few people knew of the form it would take. 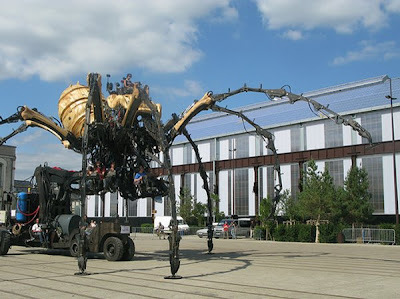 A group of French specialist researchers announced that they had been observing the creature, apparently made of steel and wood and a thousand times the size of anything in nature, for weeks. It appears to be female, around 13m tall, and has been dubbed ‘La Princesse’ by the team. The scientists believe the creature may be about to hibernate, and are attempting to prevent it falling into an inert state, as they are concerned at the potentially catastrophic results of the spider laying up to 1000 eggs. 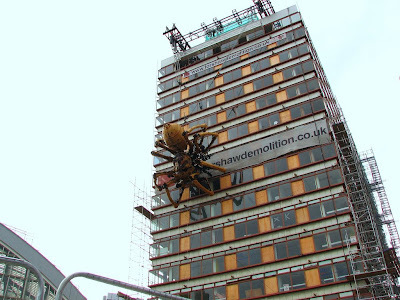 Scientists have therefore removed the spider from the building and taken it to a research base established at the ACC, at Albert Dock in Liverpool.